At the end of January, it was announced that GungHo Online Entertainment would be acquiring Grasshopper Manufacture, developer of artistically unique games like Killer 7, the No More Heroes series, Lollipop Chainsaw, and the upcoming Killer is Dead. Now, roughly two months later, they're working on their first game together. "The game will obviously have [Grasshopper Manufacture's] signature forte of hack and slash action at its base, but we hope to incorporate GungHo's power and know-how in areas we don't have." Grasshopper boss, Gouichi Suda (aka Suda 51) explained in this week's issue of Japanese gaming magazine, Weekly Famitsu. A teaser image features a long-haired woman glaring over her shoulder with the tag line "パンピーが見てんじゃねぇよ" (What are you looking at, 'normal person?') 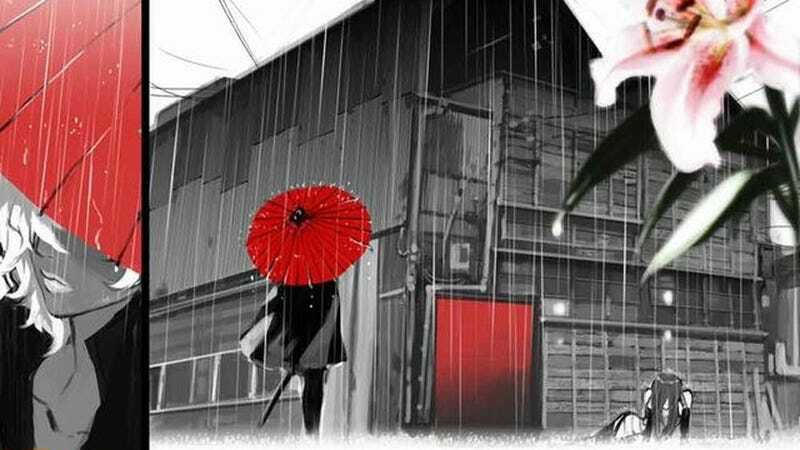 Both Suda and GungHo bossman Kazuki Morishita confirmed that the protagonist of the as-of-yet-untitled new game will be female. Released concept images show a very Asian-based world, unlike many of Grasshopper’s previous games which have taken place in very Western-ish worlds. The CEOs were a little hesitant to divulge exactly where the game takes place. "It's… Asian… I'm not even sure how much I can say any more." Morishita said with a laugh. As for platforms, talks are still in progress as to whether the game will be released on next gen or current generation consoles. Morishita did state that it would not be made for smart phones. While the release timing remains unannounced, Suda promised that it would not be too far down the line. "We’ll have more news in the fall, so please look forward to that!" I know Killer is Dead isn't even out yet, but is it wrong that I'm already excited for this?